Intex Pillow Rest Twin Airbed with Built-in Electric Pump is a multi-purpose convenient bed that comes in handy when you have unexpected guests or family members visiting for long. The airbed is also an ideal solution for comfortable sleep on your camping trips. When fully inflated, the Intex Pillow Rest Airbed with Built-in Electric Pump is a twin-sized mattress. You can therefore use your standard sheets on this bed without them slipping. Further, if you have two guests, they can comfortably sleep on the bed no matter their height or size. The mattress is 80 long, which is not common with most air beds. The Intex Pillow Rest Airbed features vinyl beams on the sides, the top and bottom. The mattress also has a waterproof top. Unlike some Intex air beds which customers have complained of quick degeneration, the Intex Pillow Rest Airbed lasts considerably longer and can withstand strain extremities. However, all air beds are not immune to wear and tear and this one is not an exception. The longer you use it, the more it will deteriorate. If you love beautiful sleep and want an air mattress you can conveniently use when away from home, the Intex Pillow Rest Twin Airbed is a good option. 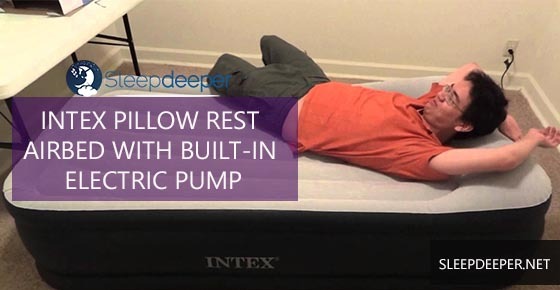 The bed has an internal pump that makes it self-inflate and stay inflated through the night without the need for re-filling. When you use it for several consecutive nights however, you may need to refill it just like other air beds. The process of re-inflation has been made easy by the built-in electric pump, which efficiently holds air. Comfort features of bed are the built-in pillows and the flocked top. These help raise the bed and secure the sheets respectively. Storing this bed is easy thanks to the sleeping bag-like storage unit it comes with. When going to a place you will need an extra bed, simply pack your air bed and throw it in the car. This bed stands at 17.5 inches, which is lower than most ordinary beds. This means kids can safely use it without you worrying that they will fall off. Moreover, the waterproof feature protects the bed from accidental spills. Lastly, the bed comes with a 90-day warranty. Although this is not so adequate considering you wont be using the bed every day for the days covered, its better than what most air bed manufacturers offer. Stands at 27.5, making it perfect for kids and elderly people. 80 long, which is convenient for even very tall people. Has flocked top that secures the beddings. Easy to store as it takes very little space and comes with a handy storage unit. When frequently inflated and deflated, it gets unusable faster. When visitors stop by your home, its not worth stressing getting a permanent bed for them if you dont have the money or the extra space. Thats why it makes sense to buy an Intex Pillow Rest Twin Airbed with Built-in Electric Pump for those surprise sleepovers.